New Article & Boxing Day Sale! Note: That's the title I gave the article when I submitted it...but while the article itself is largely what I wrote, editors usually choose the headlines. My article talks about making things for people, volunteering and sharing experiences with those you love instead of buying lots of wide screen TVs. In terms of experiences, I want to enable people to make things, of course! 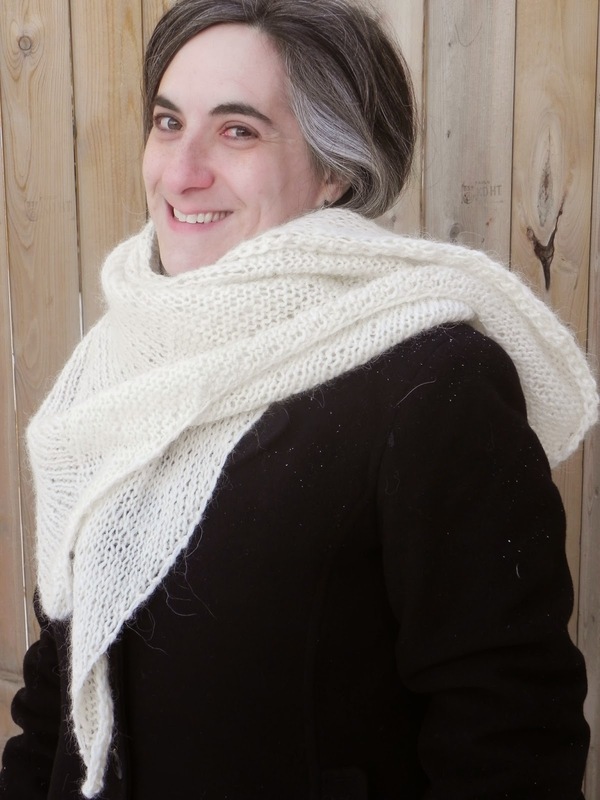 Until December 31st at midnight (EST), my knitting patterns on Ravelry are on sale. Since my patterns are in "cost of a cup of coffee" range anyway, I think that counts as purchasing something towards a positive knitting experience. I did start the sale itself on Boxing Day, but due to the winter break demands of preschooler twins (one with the sniffles), I've been delayed in posting here. 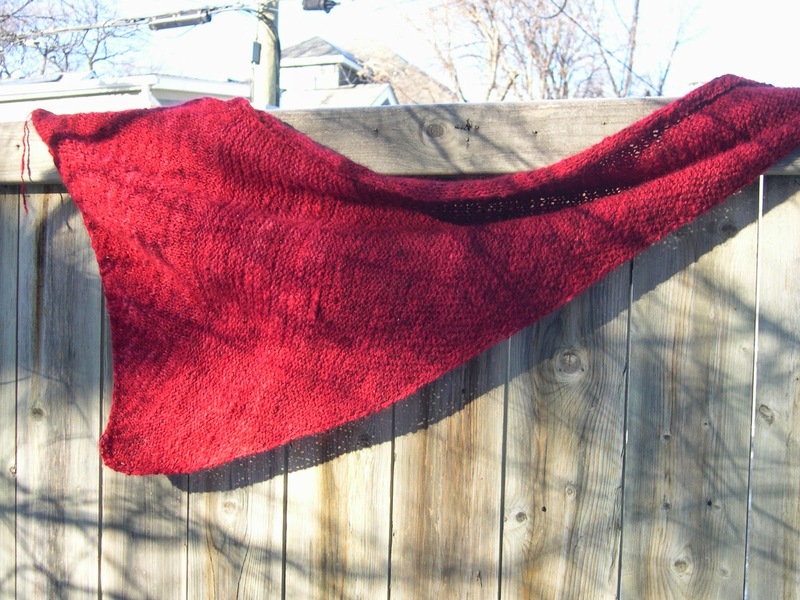 If you'd like up-to-the-moment info on Ravelry sales, please consider joining my Rav group. It would be wonderful to see you there...and if the group were a bit more talkative! I'd also like to wish everybody who reads this a warm, happy and healthy 2015. Wishing you all good things in the year to come. The sun sparkled off the snow. About 14 photos later, my camera stopped working. So here it is, about -14C (9F), warmed up from -21C this morning. Look---there I am, shooting the photo! PPS: And the takeout fish & chips (fried in oil) was pretty good, too. That was Mommy's gift! Also, here's my second crack at Distal, my newest pattern. This is my handspun yarn, a 2 ply Harlequin and longwool. The fiber and yarn are at least 15 years old, I think. It's been marinating in stash a long time! 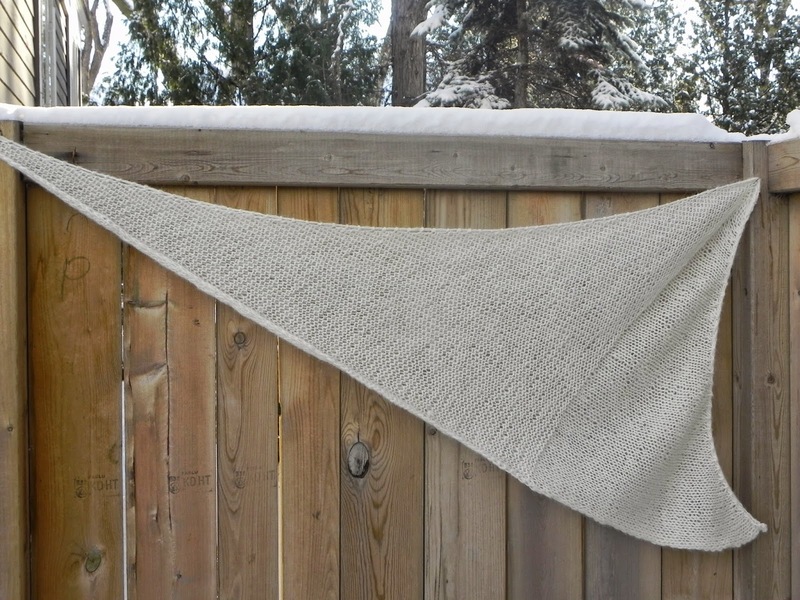 The pattern is on sale for 20% off until midnight tonight on Ravelry, as well. The photos are terrible because we had a fog advisory all weekend. When you can't see the tops of any of the high-rise buildings, it does not seem like a good time for a photo shoot, so I stayed inside. 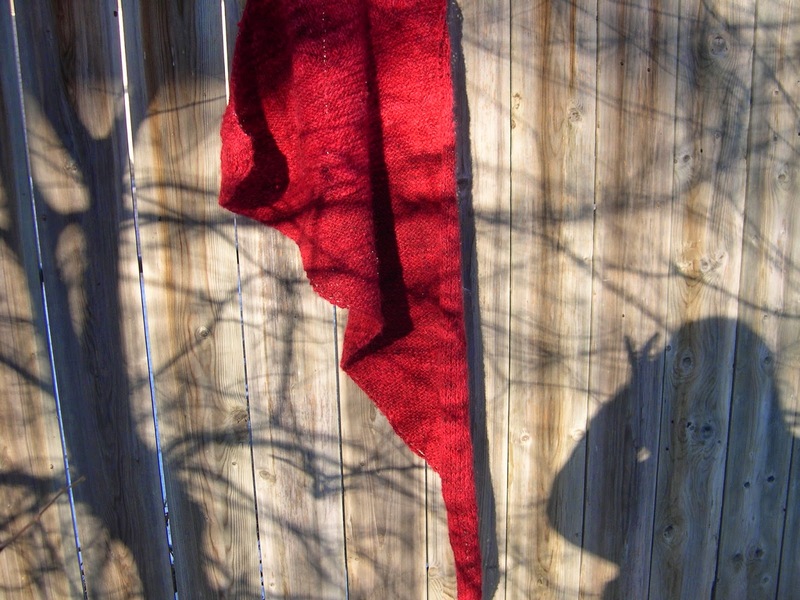 The yarn is a rich, textured red and someday maybe we'll catch a better shot of it. I'm also almost afraid to say this...but we're all virus-free at the moment and I've almost stopped coughing from the last one. This has resulted in several nights of reasonable sleep (only one twin wake up last night!). It seems too good to be true. On that wholly good note, I'll leave it before things get out of hand. It's only a matter of time before the luck runs out. be well! Stay warm! First, I cast on again. A new one! Hurray! This time, I used a hand spun heavy worsted weight 2 ply yarn (4 sts=1" on a size #8(5mm) that has been marinating in my stash for a long time. From notes I took in the pre-blog days, I think this was one ply Harlequin wool and one ply of Wensleydale or Lincoln long wool. The Harlequin was a soft, marled brown/gray/white yarn that I spun woollen and felt would not last long on its own with any sort of hard wear; hence I plied it with something more durable, coarse and spun more worsted style. Then, I dumped it into the dyepot and fell in love with the deep textured color that emerged. I saved about 800 yards of this stuff--forever. Well, not forever, but best I can tell, I bought these fleeces from 1997-2000. I think this yarn has been in stash for 15 years. Second....I decided to offer a sale. Follow this link to get 20% off Distal from now until December 15. (sale ends midnight, EST) I'm hoping to sell a few patterns. Based on rough estimates (cost of tech editing, yarn price, my time @ local minimum wage, etc. ), I need to sell about 35 patterns at $5 to break even. So, if you're tempted, please, knit a Distal! It's fast! It's a good gift...and it's on sale for even less than $5, too! Last up, I had another essay published this past week on our local CBC website. I'd clarify, before you click over, that I wish the income disparity between rich and poor in our society wasn't so great...but as long as somebody is going to earn $300,000 for a lecture, well, it might as well be an elder with amazing professional experience--that is, a woman with sound credentials. situated away from the center of the body or from the point of attachment. "the distal end of the tibia"
About a week and a half ago, I picked up some lovely Létt-Lopi yarn that I bought last winter at a yarn fire sale. ($1 a ball!) I had three skeins in the same color and dyelot. I also had an idea in mind. 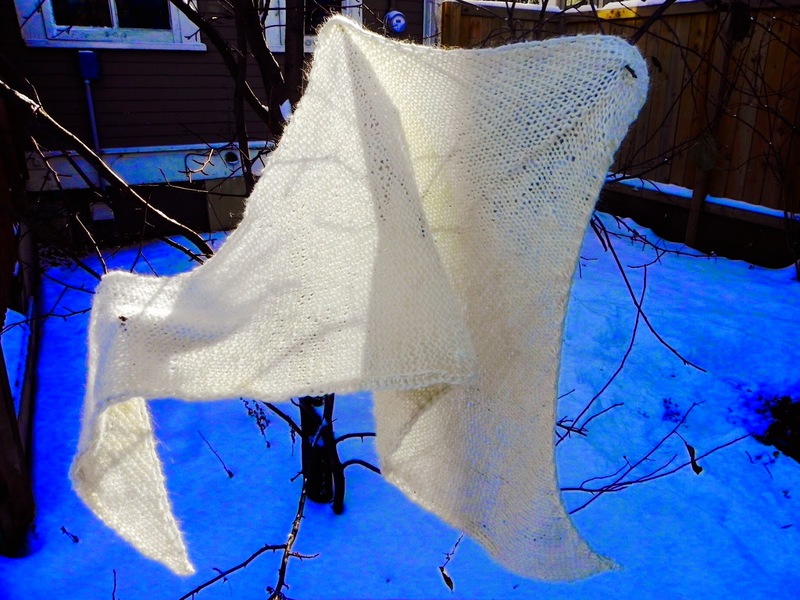 My mom wove me a wonderful shawl out of my handspun brown wool yarn several years ago. 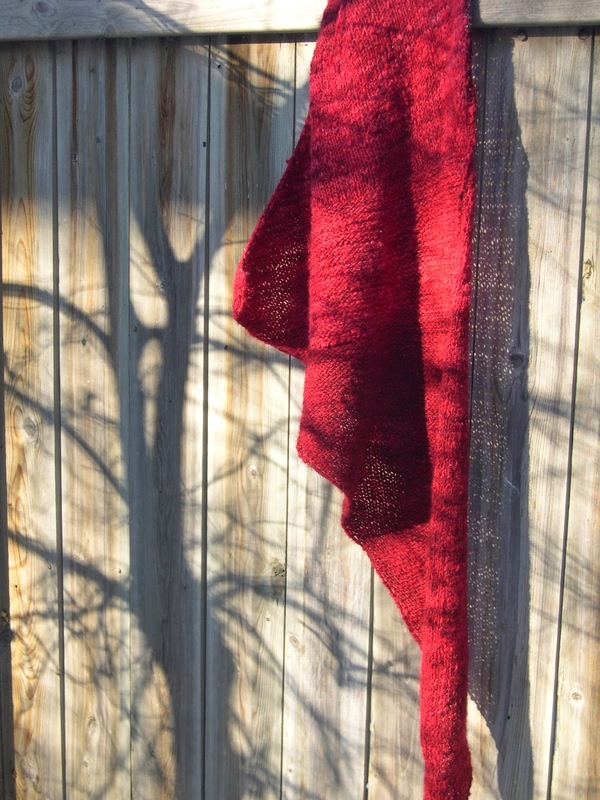 She wove it on a triangle loom from Hillcreek fiber studio. I've worn it to death and it is beginning to pill and show its age. I wanted a handknit version--and I started knitting. 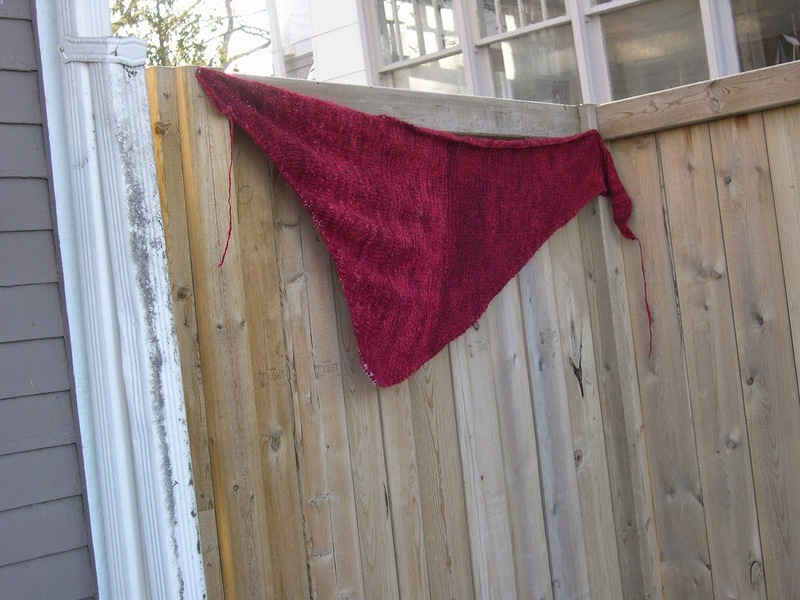 Maybe 10 hours later, I had a shawl. It was stunningly fast for me, given the twin lifestyle around here. Here's the result. I cast on Monday and I bound off on Friday. 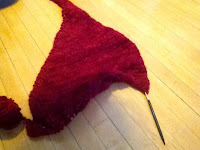 It was blocked and ready to go by the middle of the weekend, and the pattern practically wrote itself. My lovely tech editor, Donna, reviewed it at the speed of light. I present: Distal -- a shawl for wintertime...#10(6mm) needles, about 327 yards of Aran weight yarn, and only a few hours of knitting...a perfect combination for this time of year. 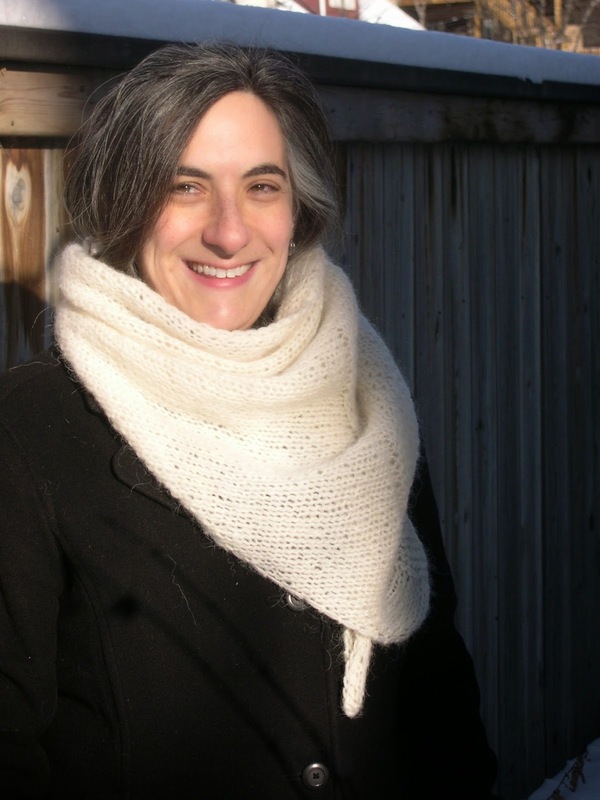 Published on Ravelry yesterday; wore it on my dog walk at 7pm this morning. 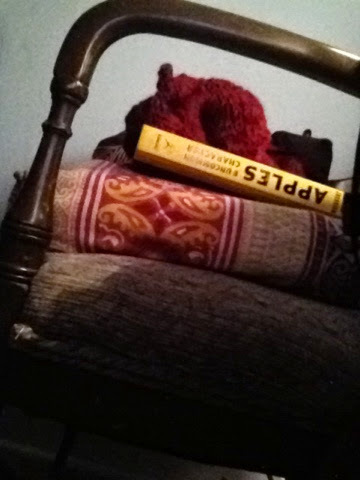 Knit fast! Stay warm!